MY FRIEND DAVID MORRIS WITH WHOM I USED TO PLAY GUITAR AND SING PAUL SIMON & ART GARFUNKLE SONG IN MARMARIS, TURKEY TO TOURISTS HAS BEEN MISSIN G SINCE HE TRAVELLED TO HAWAII DURING THE BORING 80TIES. 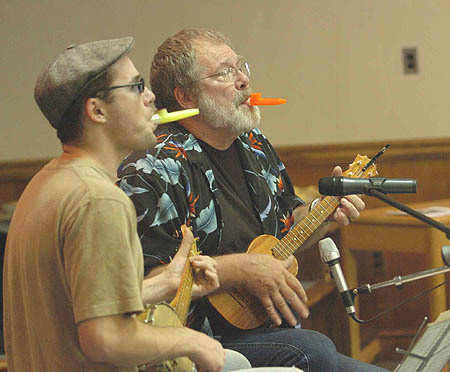 THE GUYS IN THE UKULELE FOTO DONT LOOK LIKE HIM. HE LOOKED LIKE MICK JAGGER & JAMES MASON. THIS DAVID LOVED CATS AND LOOKED LIKE A CAT HIMSELF. HE HAD A WONDERFUL SENSE OF HUMOUR OCH PLAYED THE PIANO AS WELL AND COOK CHOKOLATE COOKIES AND TOOK ME TO VISIT THE BEARS IN BERN. HE DID A LOT OF ODD JOBBS AT THE TIME. SERVING IN RESTAURANGS, ACTING IN THEATRES, LAB ASSISTENT IN HOSPITALS ETC. HE HAD BEEN BORN IN SOUTH AFRICA BUT LEFT IT EARLY FOR TURKEY. THEN LIVED IN GREECE AND ENGLAND. HE WAS A GOOD MUSICIAN AND WAS TRYING TO BE A BUDDIST. LOVELY PERSON. I MISS YOU DAVID. JULES VERNE. SWEDEN . julide.backgård@facebook .gmail.com adress: ART COLLEGE OF KYRKERUD. 672 91 ÅRJÄNG. VÄRMLAND. SWEDEN. tel: 0709300081. OU EST TU. NERDESIN ARKADASH. MEKTUP YAZ BANA. NPR : Ukulele Madness -- You Heard It Here First! Roy Smeck in "His Pastimes"
Marc Silber is Cleaning the Attic!